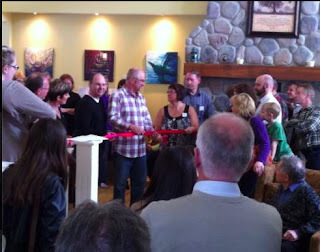 Yesterday was our Grand Opening, and we had 200+ people come, see, greet and enjoy some refreshments. Getting to the day was a WEEK LONG process of working, which involved many hours, many cups of coffee and family and friends. It was things like driving just over the Canada/US border to get some parcels (because it is cheaper to drive there and pick up versus shipping to us in Canada) ~ to going to Ikea (and having my friend Jeannette fill her truck with MY things, drive it here AND assemble much of it) ~ to our kids helping to assemble/clean/arrange stuff to get ready ~ to wallpapering a closet (my sister-in-law Jody did that - and was so gracious when she realized I had a wall paper with a "repeat") ~ to a board meeting (oh so good to meet with these people!) ~ to ordering cakes/picking up cakes ~ to having some friends from my care group come and assemble my library (thanks Julie, Jean and Ann) ~ to having Kim & Kevin come and do some work on Friday afternoon and both of them Saturday night, along with Betty and Willy all helping with those last minute things that Mike and Ash, Alvin and I worked on during the day on Saturday. Also thanks to Deb (LifeWords) who came and put the gold room name decals on the doors for me ~ Oh yes, then I was also at Pineridge Hollow picking up the last minute things, and Jan so graciously told her daughter to "let Joy take whatever she needs and we will square up this week!" And then Sunday we woke up, and were joined by Ashley, and then later by Michael and Mattie, Elmer and Jeannette, who helped get the refreshments set up and do the last minutes. And then it happened - the first people arrived!! You came - in great numbers. Alvin said it was a good test of our "structure" when we realized how many people were in here at one time! During the "ribbon" cutting ceremony - the place was packed. We heard that some were waiting in the gazebo, and our apologies for that!! The ceremony part of it was MC'd by my son Josh. He included a blessing that was sent by my nephew and niece in Calgary. Jerald Peters - architect spoke briefly. I spoke (see below if you want to read). Carolee Neufeld (board member) and Delbert Enns (Lead Pastor, Eastview Community Church, where we attend) both spoke blessings on us, our family, our ministry and all who will enter this place for a time of rest, renewal and refreshment. The board that was present held the ribbon, along with Alvin, and Jerald and I ceremoniously cut it!! IT IS A DONE DEAL!! Those who set up/hosted/cleaned up in our kitchen: Elmer & Jeannette, Willy and Betty, Marilyn, and then Kim, along with my brother Tim and Jody : Thanks!! For the Door Prizes donated by Irmie Giesbrecht, Kim Carter, and Ann Sawatzky: THANK YOU SO MUCH!!! For all of you who came and attended - Thanks!! It would not have been a success without you! For those of you who donated toward the ministry - THANKS!! You have blessed us financially. For those of you who are booking - We look forward to hosting you!! To our Photographer: Soumela Krystik - we can not say how thankful we are that you chose to do this for us - and your "retreat" days can be booked any time!! Just call!! To those of you who worked your trade in our house - Henry Martens (plumber) Jake VanLeeuwen (electrical) and Jack Funk (electrical), Mike Krystik (heating) and Mike Frank (jack of all trades and master of them as well!! ) THANKS. To Jerald Peters, Rick Klassen and Neil Klassen - for giving your input and coming to our aid!! THANKS, words are not adequate!! To Jan Regehr and Pineridge Hollow - Your support (in so many ways) has been such a blessing to us!! And the chairs - continue to bring beauty in this place, along with many decor items, bed spreads, etc. Thanks for your friendship and your support!! To Faye Hall - artist, and friend. Thank you for allowing us to showcase your beautiful art!! You are so talented and we look forward to some possibilities in the future!! To Janet Fast and Kara Carson (Fast Insurance) for your knowledge and dedication to getting us the best insurance for the place, and the ministry! For all of you - family and friends ~ who have prayed for us along the way, supported us, helped swing hammers, put in door latches, plant shrubs, clean toilets, label library books and on and on (I really don't want to forget anyone - and forgive me if I have!) THANKS FOR YOUR CONTINUED PRAYERS. Finally, to my husband Alvin, and to my kids, and my grandchildren - I thank God for you - for your love, for your wisdom, for your care of me, for your love, for your help in ALL the ways you have helped - wow, words can not describe how my heart overflows. God has called us to something that I think, correction, I KNOW is way bigger than what we can imagine - and I am so glad we are on this journey together! I am blessed to be your wife, your mom, your granny. To God be the glory!! Friend and stranger, from near and far. May each be blessed and honored as they enter. Since that time, our lives have been an adventure to put it mildly! about obedience, about His timing being perfect especially when we think we know the best time. During that time God has not only called me to this, but he has also added my kids and a husband who has felt the call so strongly that he has been doing what we have called - the Noah thing - since June of 2010 when we began to build the barn, and then the house. You know, some people ask us - do you think women will come? Well - we don’t know how full we will be - or how often. However we firmly believe that when God calls you to something - he doesn’t hang you out to dry. Since 2000 our family has walked through deep waters. It was after the death of our first grandson, that our kids Josh and Leah came back with a challenge to sell what we owned in Anola, and buy land and build a combined ministry house and personal space. That is when Jerald and I met and he agreed to design what you see here today. These last 3 years have not been easy. Personally, we felt the call to buy the land, build the shop, and the house - and then live in a basement suite so that we could use the house predominately for bed and breakfast style retreat for women! God has also laid other ideas on our hearts, and we continue to hold our house with our hands turned up - and look forward to seeing what God has in store here. I believe that too many women don’t see how precious they are in the eyes of God. My daughters and I imagined what we could do to help women feel special and to help provide a setting that leads you to retreat with God, and today, what you see here - has all been very intentional. I don’t think a single thing has been placed without much thought! Alvin, aka Noah, and our boys, Joshua and Michael - have worked long hours, from the ground up - there is alot of swet equity built into this home. Often I would just watch, and it was when I watched that I realized that God had also called Alvin, and our kids. And I am so blessed by that. And I have often stood, I am sure, with my mouth hanging open. But it has, and we are thankful! September 15th, we had a come, walk and pray, and people walked the land, and rained on it with prayer! During the build, several people came to visit, but also to just walk through the place, and once again, they prayed. As a family, we have seen God work in amazing ways. We want to thank you for that! Jerald - thank you for listening to the call to this vision, way back in 2002. Thank you for your generosity - taking time out of your own career - to design this - from the walkabout we did together in March 2009 - until today - your signature is on this place! Thank you for believing in what we said we were called to do, and for walking alongside and meeting with us over all those coffees at Mountain Bean. We can’t say enough thanks! Alvin - I don’t know another man, who would work so tirelessly and endlessly - right up until the 11th hour - and be so committed. I have seen how God has grown us during this journey toward today. To my kids - I am so glad God has also called you to this. It has been exciting to plan this, and build it together - and it will be exciting to see how the future unfolds with you all living so close by. I look forward to our grandkids being a part of this as well. We are blessed. To our family, and our friends - thanks for your love, your support and your help. It doesn’t matter how much time you put in, or what you did - you have to know that each volunteer hour was greatly appreciated! To our board of directors - thank you - for your input, guidance and prayers - we are working together - and that is a blessing! We want to continue to hold these possessions very loosely, with upturned hands, and wait to see how God will use it for his glory! It is my prayer for each and every person that walks through these doors. 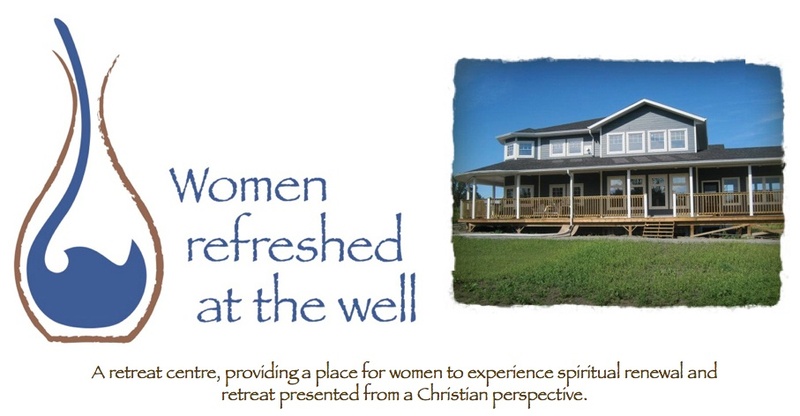 AND CHECK OUT THE TAB AT THE TOP for the "SUGGESTED ROOM PRICES"
come to for spiritual retreat, refreshment and renewal. We look forward to offering you directed retreats as well.